The following information was taken directly from Appendix C of the SERIM (EPA and USACE 2008; see the reference at the end of the article) and is required for completion of an MPRSA Section 103 evaluation. Information should not be repeated, but referenced where material is needed for more than one part of the evaluation documentation. ii. The material is substantially the same as the substrate at the disposal site and the dredging site is far removed from sources of pollution so as to provide a reasonable assurance that such material has not been contaminated by such pollution. b. If one of the exclusionary criteria is met, items 3 through 6 below need not be addressed. (2) ADDAMS STFATE result (if required) for the contaminate requiring the most dilution. Include any special disposal practices (e.g., minimum distances from site boundaries, tidal state, current magnitude/direction) that must be instituted to assure compliance. a. Tier II tests for benthic impact evaluation should be used only to screen out sediments that are not likely to meet the criteria or to assist in selecting a compositing or testing scheme under Tier III. i. For federal projects, provide authorization and reference Feasibility Study or other NEPA document providing assessment of disposal alternatives. ii. For non-federal projects, the alternative disposal alternatives should be summarized and assessed. The final determination is made in the USACE Statement of Findings on whether or not to grant the permit. i. Reference appropriate section(s) of the site designation EIS/EA to address potential impacts of disposal at the site on recreational fisheries, commercial fisheries, shore recreation, and cultural resources with regard to disposal of dredged material at the site. iii. Address presence of toxics and bioaccumulative chemicals (reference 6 above). iv. Address pathogens (reference 7.a.iii above). 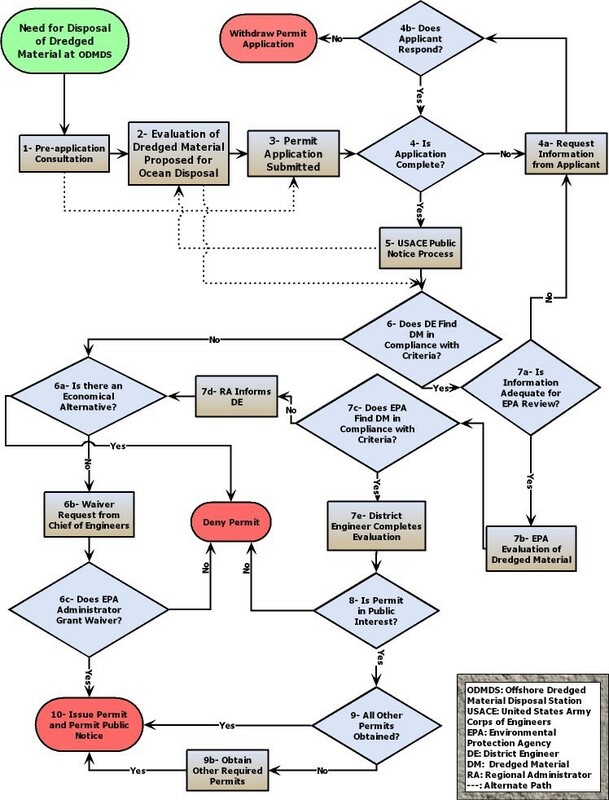 c. Requirements necessary to meet the requirements of the disposal site SMMP. d. All conditions must be implemented through permit conditions or contract specifications for federal projects. The draft permit conditions/contract specification must be included as part of the MPRSA Ocean Disposal Evaluation Documentation. These are typically available from the SMMP. USEPA/USACE. 2008. Southeast Regional Implementation Manual (SERIM) for Requirements and Procedures for Evaluation of the Ocean Disposal of Dredged Material in Southeastern U.S. Atlantic and Gulf Coast Waters. EPA 904-B-08-001. U.S. Environmental Protection Agency Region 4 and U.S. Army Corps of Engineers, South Atlantic Division, Atlanta, GA.
MPRSA Section 103 permits for the transportation of dredged material for the purpose of disposal at an approved ODMDS are issued by USACE SAD district offices. MPRSA Section 103 applications should be consistent with USACE permitting regulations in 33 CFR Parts 320 to 330. All information submitted as part of the MPRSA application process should also comply with EPA Ocean Dumping Regulations in 40 CFR Parts 220 to 228. USACE SAD districts will coordinate all sediment testing plans with EPA Region 4. Pre-application conferences to prepare appropriate sampling plans are encouraged for all MPRSA Section 103 permit applicants. Upon receiving all necessary information from the applicant, USACE SAD districts will provide for EPA Region 4 review the complete documentation of the project evaluation conducted under the SAP in the form of a Section 103 evaluation. This information can be provided prior to, with, or after the Public Notice. The evaluation reports will be consistent with the information provided in Appendix C and will be accompanied by a Section 103 Sediment Testing Report (Appendix D) and draft permit conditions necessary for implementation of the ODMDS Site Management and Monitoring Plan (SMMP). USACE SAD districts are responsible for coordination of all federal actions, including EPA Region 4 concurrences, pertaining to MPRSA Section 103 applications. The applicant may also need to coordinate activities with the appropriate state regulatory agencies for compliance with Section 401 of the Clean Water Act and the State Coastal Management Program [Coastal Zone Management Act Section 307(c)]. A schedule for coordination is provided in Appendix B.
Pre-application Consultation: Includes discussion of the need for the dredging project and a discussion of alternatives and the qualitative and quantitative information required by the District Engineer for use in evaluating the proposed dredged material. Evaluation of Dredged Material Proposed for Ocean Disposal: Includes development, approval, and implementation of the SAP. This step should include close coordination between EPA Region 4, USACE SAD districts, and the applicant (see Section 2.2). Permit Application: According to 33 CFR 325.1, a permit application must include the items listed in Table 2-1. Additional information is requested if the application is incomplete. Applicant is given the opportunity to respond according to each district’s review schedule. Public Notice: If the application is complete, USACE issues a Public Notice per 33 CFR 325.3. The notice must include all of the information required in 33 CFR 325.3(a), including the information required by 40 CFR 225.2(a) (see Table 2-2). A supplemental revised or corrected Public Notice will be issued if the District Engineer believes the new information affects the review of the proposal. Economically feasible alternatives are reviewed. If an adequate alternative is identified, the decision to deny a permit is discussed in either a Statement of Findings or Record of Decision. If no alternatives are available, a request for waiver from the Chief of Engineers is applied for. The EPA Administrator reviews the waiver request and either denies or grants the waiver. EPA MPRSA Review: Independent review of the information will be performed to determine whether the disposal activity complies with the criteria found in 40 CFR 227 and 228. This includes a review of all necessary physical, chemical, and biological tests. Refer to Table 2-3 for detailed explanations of EPA MPRSA review periods. USACE Public Interest Review: USACE must consider all comments, suggestions, and concerns provided by all commenters and incorporate their comments into the administrative record of the application. If the permit is determined to be contrary to the public interest, the decision to deny a permit is discussed in either a Statement of Findings or a Record of Decision. Other Permits: If the permit is not contrary to the public interest, review of other required permits needs to be addressed. If applicable, other application permits from federal and state agencies need to be obtained. Permit Issued: A decision to issue a permit is discussed in either a Statement of Findings or a Record of Decision, and a Permit Public Notice with a list of permit decisions is published by USACE. A complete description of the proposed activity, including necessary drawings, sketches, or plans. The location, purpose, and need for the proposed activity; scheduling of the activity; names and addresses of adjoining property owners; location and dimension of adjacent structures. A list of authorizations required by other federal, interstate, state, or local agencies for the work, including all approvals received or denials already made. The source of the material; the purpose of the disposal and a description of the type, composition, and quantity of the material (this ideally includes information necessary to determine if the material is in compliance with the criteria); the method of transportation and disposal of the material; and the location of the disposal site. The application should include: (1) an evaluation of dredged material disposal alternatives, including an examination of potential beneficial uses of the proposed dredged material and a consideration of alternative disposal options before selecting the ocean disposal option (40 CFR Sections 227.14 to 227.16), and (2) documentation of the criteria used as the basis upon which selections or rejections were made. If prior evaluations are current, reference to them is encouraged. Include written documentation of the site dredging history, including all results from previous sediment testing (both abiotic and biotic) and a general survey of other prior or current dredging activities at or near the site. If prior evaluations are current, reference to them is encouraged. If the ocean disposal application for re-certification of the proposed maintenance dredged material is currently covered or was previously covered under a MPRSA Section 103 disposal permit, the permit number (or Public Notice and date) should be provided. If more than 3 years have passed since the last evaluation was conducted for the dredge site, or if data are considered to be inadequate, the USACE SAD district, in consultation with EPA Region 4, will assess the need for additional evaluation. Give detailed information along with written documentation on known or suspected site contamination including oil, chemical, or waste spills and any other discharges that may cause contamination of the proposed dredging site. The local U.S. Coast Guard and Port Authority offices shall be consulted to obtain additional information on spills or suspected contamination. Results of the consultation shall be documented as part of the application. Any chemicals known to contaminate or suspected of contaminating the proposed dredging site must be added to the list of possible COCs (see Section 5.0 of this manual). Include the disposal site corner coordinates and center coordinates (latitude and longitude). Include distance from shore and water depth. Include disposal zone if applicable. Include date of designation and/or CFR citation. Include a statement as to why an EPA-designated ODMDS is not feasible. Address the 5 general (40CFR228.5) and 11 specific criteria (40CFR228.6) for the proposed site. Detailed information is typically provided in a supplemental document such as an Environmental Assessment. Provide year site was first used. Provide volume of material disposed at site (see Ocean Disposal Database: http://el.erdc.usace.army.mil/odd/). Include details regarding most recent disposal project (volume, dates, physical characteristics, disposal zone if applicable). Provide the anticipated date for initiation of disposal activities and the expected duration of disposal activities. At a minimum, provide results of physical tests. 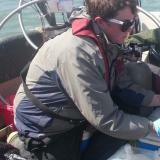 Also provide results of chemical and biological tests on the dredged material if available. If EPA Region 4 has concurred on the suitability of the material for ocean disposal, this should be mentioned here. If additional tests will be conducted, this should be explained as well as how the results will be made available to the public. * Information provided for the Public Notice and other pertinent information will be used by USACE as an aid in determining the suitability of the proposed dredged material for ocean disposal under the criteria defined in 40 CFR Part 227 (see Appendix C for Section 103 Evaluation Report). If the data submitted by the applicant are insufficient to evaluate the proposed dredged material and prepare the Section 103 Evaluation Report (Appendix C), USACE SAD district, with the cooperation of EPA Region 4, will request additional information.